Sheep’s sorrel, also known as field sorrel and sour weed, is a weedy perennial plant that inhabits pastures and meadows, often to the point of invasiveness. It is distinguished from other sorrels, like garden sorrel or French sorrel, from its smaller size and reddish tint the foliage takes on in late summer. The herb has a long history of use in Europe as a vegetable and salad green. The lemony, tart flavor of the leaf is enjoyed in tea blends and as a seasoning in soups, stews and other cooked foods. Sheep’s sorrel is also a traditional curdling agent that is still used by artisan cheese makers. Rumex acetosella is a perennial herb of the Polygonaceae family. Commonly called sheeps's sorrel, this plant produces a slender and reddish upright stem, which is branched at the top. It will grow to a height of approximately 18 inches, with its small, arrow-shaped leaves being slightly longer than 1 inch (3 cm). The leaves are smooth with a pair of horizontal lobes at the base. Sheeps's sorrel flowers bloom from March to November. The plant's yellowish-green male flowers and reddish female flowers develop at the apexes of the stems on separate plants. These blooms will develop into the plant's red fruits. These fruits are achenes, meaning they are one-seeded, small, dry fruits that do not open to release their seed. Sheeps's sorrel is often considered to be a hard-to-control noxious weed due to its spreading rhizome. 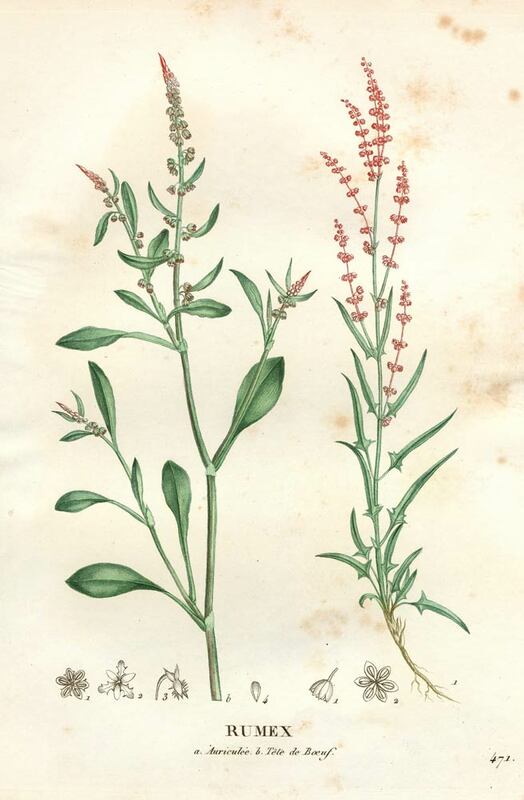 The name of Rumex was appropriated from the Latin name for a similar European sorrel. It comes from the Latin word Rumo which was taken from the Greek word Rufo. Rumex acetosella is found in central and southeastern Europe, including Britain, as far north as Scandanavia and Iceland, and has been introduced to most of the rest of the northern hemisphere. Sheep sorrel is commonly found in sunny fields, grasslands, and woodlands. It thrives in floodplains and near marshes. It is often one of the first plants to grow in disturbed areas—especially places with acidic soils—such as abandoned mining sites. Sheep sorrel prefers moist, moderately fertile, well-drained soils; it is often found thriving in acidic soils. Sow seeds in spring or fall directly into the garden soil for best results, you can also divide the plant in spring and plant out the divisions. Sheep sorrel may be harvested throughout spring, summer, and fall, late in the afternoon or early in the morning if the dew on the plants has evaporated. Dry the leaves and plant parts for later use. Store sheep's sorrel and powdered sheep's sorrel in an airtight container in a cool, dry place.